White House Press Secretary Sarah Huckabee Sanders’s decision to release a video of CNN’s Jim Acosta refusing to hand a microphone over to a White House staffer led many in the press to attack the Trump administration as trying to mislead the public — citing the fact that some of the frames in the video appear altered. 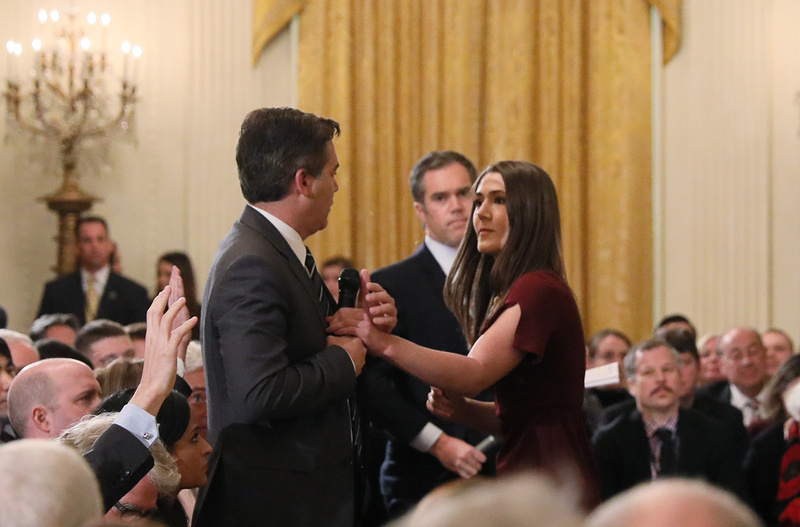 A White House intern reaches for and tries to take away the microphone held by CNN correspondent Jim Acosta as he questions U.S. President Donald Trump during a news conference at the White House in Washington, U.S., November 7, 2018. Picture taken November 7, 2018. REUTERS/Jonathan Ernst. President Barack Obama’s Justice Department and FBI came under fire in June 2016 after it became clear that the Orlando gunman had pledged loyalty to the Islamic State (ISIS) and his religious beliefs in a call to the police before massacring 49 people in a gay nightclub. Inexplicably, many noticed, the official transcript had redacted these references. The outrage was swift. Immediately, Republicans and members of the public accused the Obama administration of trying to hide the Omar Mateen’s true motivations for political purposes. “As much of this information had been previously reported, we have re-issued the complete transcript to include these references in order to provide the highest level of transparency possible under the circumstances,” according to the DOJ and FBI’s statement. But the entire incident raised serious questions about how the federal government can manipulate information it provides to the public. After all, this wasn’t the first time. “No, Kevin,” Earnest told Fox News’s Kevin Corke. Yet that line was absent from the official White House transcript. The White House also admitted a staffer had deleted eight minutes from a 2013 video — once again in relation to the Iran Deal. Despite these actions, the country somehow never faced a Democratic crisis. Our institutions weren’t irreparably damaged and few reporters wondered if the president was spreading propaganda. In other words, the press understood that letting the Obama admin get away with such actions was just part of their job.